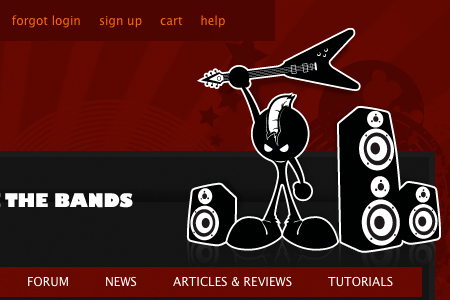 Madeloud.com recently launched its new site to the indie music community with some unique new ideas. To begin, they’re offering unlimited digital upload space for the first 300 bands to sign up. That in itself is something unprecedented in the independent music arena…underground bands and solo artists can also promote and sell their digital music direct to fans in one place without the red tape and high percentage fees required by other music portal providers. MadeLoud contracted LevelTen Interactive to develop the site and they’ve incorporated all of the best online social networking tools including: personal profiles, mini-blogs, videos, custom ring tones, music forums, album cover uploads, and page promotion tools. Unsigned bands can promote their albums as a whole or as individual songs in one place bypassing the typical wait for other known portals. Placing orders to support local bands is extremely simple, and the artist keeps 80% of the sale of their digital downloads and 85% of merchandise revenues, which is much higher than any other similar independent music offline or online store. The site boats a bold, edgy feel (which I’m proud to have designed) that echoes the whole idea behind the site.. This isn’t your momma’s music portal. If you’re an indie music artist, what are you waiting for? Cut through the red tape and high fees, join the 150 bands 300 fans this month who have already secured a free platinum account with unlimited upload space by signing up at www.madeloud.com.